A trigger finger is a painful condition that causes the fingers or thumb to lock when bent. If this condition occurs with a thumb, then it is called trigger thumb. A trigger finger occurs when the tendons inside a finger or thumb become inflamed. The tendon is a tough band of tissue that connects the muscle and bones together. The tendons and muscle in the hands and arms in conjunction bend and straighten fingers and thumbs. 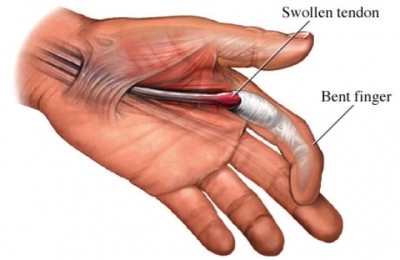 In order to understand a trigger finger, we need to look at the physiology of a tendon and muscle. A tendon glides easily through the tissue, known a sheath, due to a lubricating membrane surrounding the joint called synovium. At times, a tendon may become inflamed or swollen. If this occurs, bending the finger or thumb can pull the inflamed tendon through a narrowed tendon sheath which causes it to snap or pop. Trigger finger is caused by repeated movement or forceful use of finger or thumb. Some of the conditions that can cause trigger finger are rheumatoid arthritis, gout, and diabetes. Another way that trigger finger can be caused is by grasping a power tool firmly for a long time. This is when a trigger finger may become a worker’s compensation injury. Some individuals that are more prone to getting the trigger finger are farmers, industrial workers, and musicians because they use their finger and thumbs repetitively. Trigger fingers occur mostly in women and in individuals between the ages of 40 to 60. One of the primary symptoms of the trigger finger is soreness at the base of the finger or thumb. The most common symptom is a painful clicking or snapping when bending or straightening the finger. This sensation worsens after the finger or thumb is resting and generally loosens up after movement. In certain cases, the finger or thumb may be locked in a bent or straight position as the condition worsens and has to get gently straightened. The primary way to diagnose trigger finger is a physical exam of the hand and fingers. In certain cases, the finger can be swollen and there might be a bump over the joint in the palm of the hand. The finger may be locked in bent position or become stiff and painful. There is usually no x-rays or done labs done to diagnose trigger fingers. The first step taken in treating a trigger finger is by using a splint to prevent the joint from moving. If the condition persists, then a doctor may prescribe anti-inflammatory such as ibuprofen or naproxen. In certain circumstances, a doctor may give you a steroid shot in the area of the tendon sheath. If the trigger finger still does not get better then that is when surgery would take place. The recovery is contingent on two things: the severity of the finger and the recovery treatment. If a patient gets a splint to treat the finger then it can take up to six weeks for recovery. On the other hand, patients can get better after a few weeks of resting and anti-inflammatory drugs. This is in no way intended to serve as medical advice. If you have any questions or concerns, please consult your doctor. This entry was posted in Uncategorized and tagged california's workers compensation, fingers, hand injuries, muscles, tendon, tendon sheath, thumbs, trigger finger, trigger thumb, worker compensation, worker's compensation. Bookmark the permalink.